To do, or not to do, is a complex question. We are all burdened with too much to do in too little time. Often, important tasks slip through the cracks. The best life hack solution of all time is an underrated one; list-making. It doesn’t matter whether it’s on paper, dry eraser board, or smart phone, WRITE it down. If your To Do list lives exclusively in your head, it is doomed to fail. Noone can possibly remember all things that need to get done in one day, and/or sort them from the other gazillion random thoughts swirling around in your head. You know I’m right. Try keeping a pad handy (in more than one place) in your home, and in your car to “catch” the thought, an idea, or the something you remembered you forgot. I’m all about writing things down because it gets tasks out of you head and onto a piece of a paper. This is a productive way to reduce brain clutter, release resonating ideas and make more room for new ones. Yes my friends, the brain can get cluttered too, just like any other space in your home. No shocker here that as a Professional Organizer, I’m a huge advocate of list-making. As you would imagine, my lists have sub-lists, and I have checklists for my checklists. And there is no greater pleasure than checking off or crossing out a task once it has been completed. You might be wondering what it really means to have a “successful” to do list. It’s simply one that is productive, because it works. So before crafting your To Do list, consider these steps first. Distinguish a to do list from a wish list. They are not the same thing. Short and long term goals should be on a way different To Do list. Separate daily tasks from weekly ones. Put the tasks in order of importance. Ask yourself, “does this HAVE to get done today? As part of the prioritizing process, think about the time-management component. Which of the tasks are time-sensitive? Create a timeline. Are they realistic? Have you left yourself enough time to accomplish them? Strategize your route. It’s better to do the furthest destination first and work your way back home. This ensures that you get it done before procrastination flirts. It’s always easier to do the easy errand even when you’re tired. Review the list both before you tackle it, and after the day’s end. Situations change all the time and so it’s important to edit the list often. Re-write the list to possibly change the order, add or delete. Keep it current. The benefits of list-making are invaluable. Think about it as “organizing” your brain. It enable you to structure your day and follow a plan with a cognitive focus. You can also create more than one To Do List. Sorting your tasks by “like” actions is a super efficient strategy. Perhaps separating your grocery list from your other errands would help manage this. Hey, you don’t want to come home without the veggies you needed for dinner, lol. 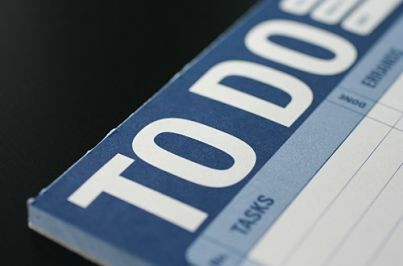 By organizing your To Do list, you will not only reduce the overwhelm, you will make it doable. Breaking down the grandiose task list by category, importance, and time-frame will help you to manage it and yield success. What’s on your To Do list? Have you planned for success?